Slowly, but surely, we’ve been working on our patio landscape project. It’s come along nicely and my hope is that by the end of the weekend, it will be complete. 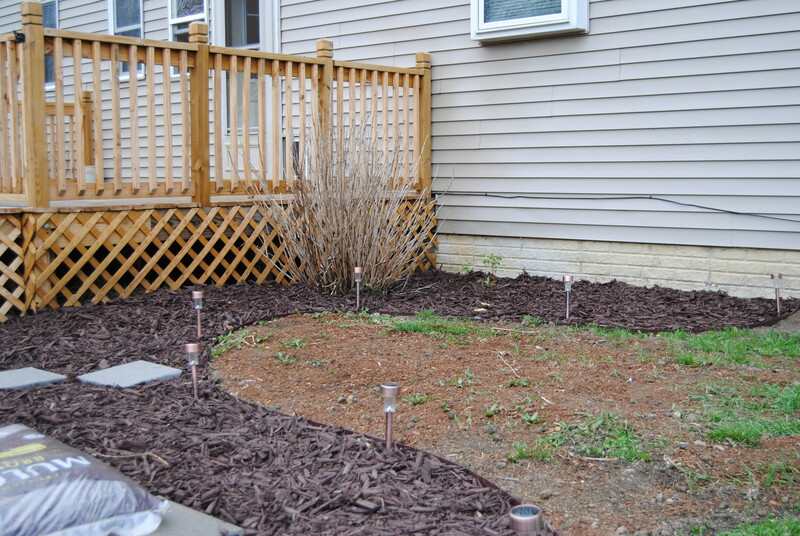 I put grass seed down as well and we are due for another spring shower tomorrow, so hopefully new, beautiful green grass will fill in the bare spots around the new landscaping. I also have a new hydrangea bush arriving any day now. It will make its home just on the other side of my new Mock Orange bush. Granted, it will take a couple of years for everything to really fill out, but I think it will look lovely. The other empty space will house pots of fresh herbs. My goal is to not only have wonderful herbs for cooking, but I will learn how to make my own salves, teas and tinctures. I’m so excited about the possibilities!! Once the project is completed, I’ll make sure to post before and after pictures.